his is another project by ya boy pr0ph this time its a player mod!, This mod has all solar flare armour and weapons! if you want something else added ask me and it might be put in! This is in alpha so don't expect everything to be there follow me so you can get notified by me when i update this player mod! Enjoy the mod and don't abuse it to much! Install it to ====> \Documents\My Games\Terraria\Players if you dont have that just go to documents if there is no My Games folder (there probably will unless you deleted it!) Look for where your .plr's are located. And place the file in there. That's all enjoy! 4. 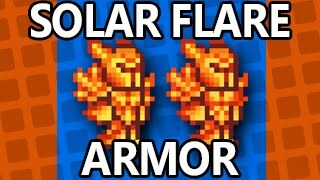 Solar Flare Helmet, Solar Flare Breastplate, Solar Flare Leggings, And Solar Flare Wings. Submit a suggestion on the website and it might be approved and you will get a shout out! Guys, Don't forget were having a CUSTOM player load out giveaway! Witch means if you follow me and comment on THIS mod you will be entered! 5 people will win! The first five to comment will get the opportunity! Thank you guys so much 18 downloads! Thats AMAZEING! Im make something special!